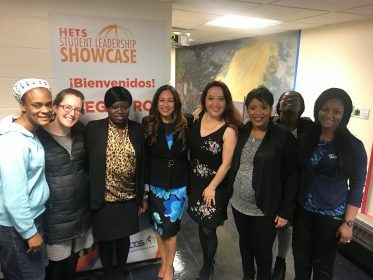 With a full room, more than 70 students from different member institutions, participated of the HETS Student Leadership Showcase, held on April 26, 2017 at Lehman College, Bronx NY. This event was designed for students at HETS member institutions in the Northeast Region. The main purpose was to promote the access to free of charge online student services that can support their academic goals, and emphasized on how their multicultural background will help them succeed, through the expertise and experiences of a recognized Multicultural Professional Coach. 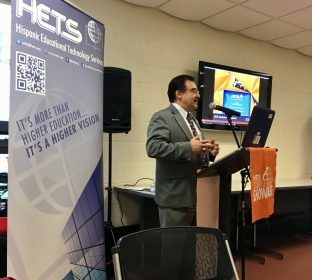 The event started with a warm welcome message from the host, Dr. José Magdaleno, Vice President for Student Affairs at Lehman College. After his remarks, Ms. Yubelkys Montalvo, HETS Executive Director, shared a live demonstration of HETS student services at the HETS portal and the Student Placita. 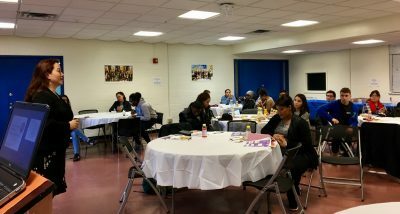 During this demonstration, students had the opportunity to learn where to find information about scholarships, internships, job search, practice of standardized tests, online tools and careers tips, among other services provided by HETS. In addition, students were able to network with other peers from other member institutions, and also HETS Executive Director learned more about student’s interests and needs in order to further collaborate on exploring solutions and create innovative support services. Ms. Montalvo’s demonstration concluded with a trivia, where students participated and received prizes for each correct answer. The event continued with the speech of Ms. Minué Yoshida-Aydelott, Multicultural Professional Coach, who talked about how your multicultural background will help you succeed. Ms. Yoshida- Aydelott presentation’s emphasized on how individuals criticize or stereotype the cultural backgrounds, based on age, ethnicity, preferences, etc., and how often people believed they are part of their list of weaknesses, or just something to “overcome”. During her speech, she presented strategies to learn how to convert any perceived obstacle in their strongest asset. Ms. Yoshida-Aydelott was born and raised in Mexico City, she fully understands the impact of global markets, and the importance of reinforcing the strengths within a multicultural environment, as her mother is Mexican and her father is Japanese. As a Multicultural Professional Coach, she works closely with diverse groups focused on diversity and inclusion, and was in charge of Training and Development for the multicultural markets at New York Life. She has also worked with some of the top financial institutions in the USA and Fortune 100 Global companies in Latin America, including Mexico, Brazil, Argentina and Puerto Rico. Ms. Yoshida-Aydelott has recently being included as part of the book Today’s Inspired Latina VIII. The event concluded with a raffle of prizes among the participants, and the completion of the evaluation form distributed to receive the feedback of the event and the online services presented. HETS would like to make a special recognition to the support and help of the Lehman College staff, especially Dr. José Magdaleno, Vice President for Student Affairs, and Ms. Suzette Ramsundar, Associate Director, Office of Campus Life, Student Life Building at Lehman College.